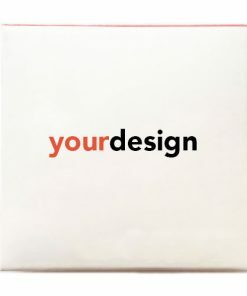 Create a custom condom packet by simply uploading a design and placing your order. Unless you specify otherwise at checkout, your design will be printed as large as possible within the printable area and will be placed centrally. If you would like to add multiple images and your own text, please use our custom packet designer. View full pricing table below. To access the lower cost per condom, just add the appropriate quantity to your basket and the discount will be automatically applied. Please note, this bulk discount is per design. 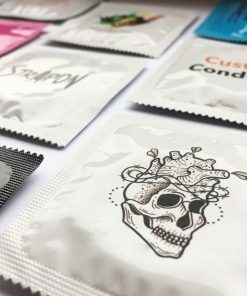 Your design will be printed onto a white background on the front of the condom wrapper. Other colour packets are also available – pink, blue and black – please enquire for more information. The back of the packet features standard safety information and instructions. We can only offer customisation on the back of the condom packet for orders of 20,000 pieces or more. The condoms are standard size. The length is up to approximately 180mm and the width is approximately 53mm. The condom wrappers measure approximately 60mm by 60mm.